Scorching temperatures and sand dunes might not be the first image that comes to mind when you think of China, but the country is home to the desolate Taklamakan Desert. This desert is nearly as big as the country of Germany at 337,000 km sq and lies in northwest China as part of the Xinjiang Uyghur Autonomous Region. The desert is an area known for its extremes. In the summer, temperatures can easily reach 40˚C while the winter months can become bitterly cold, with temperatures dropping below -20 ˚C. Combined with its shifting sand dunes, the area is almost uninhabitable but permanent residents include the Bactrian camel and the long-eared hedgehog. Bordering the south-western edge of Taklamakan Desert you will find Hotan, a large oasis town that attracts tourists every year. Known for being the most ancient section of the Silk Road, there is plenty to explore. Visitors often spend time discovering the many ancient sites and browsing through the variety of shops in the bazaar before heading into the desert for camel trekking. Commonly referred to as the 'Roof of the World', Tibet is known for its harsh winters and cold, dry climate. With an average altitude of 4,950m, oxygen levels in this mountainous region are considerably lower than the rest of China. Even during the summer months, overnight temperatures regularly drop below 0˚C. Tibet's capital, Lhasa, is filled with a number of majestic temples and monasteries and therefore, is considered a very sacred place. One of the highest cities in the world, Lhasa translates to ‘Place Of The Gods’ and is visited by many all year round. A culturally significant part of Asia, must-see Buddhist sites include Jokhang Temple and Potala Palace. To the north-east, Harbin in the Heilongjiang province is one of China's coldest major cities. Despite seeing hot temperatures during summer, this metropolitan location is often freezing cold during winter with temperatures as low as -35˚C recorded. Nicknamed the 'Ice City', Harbin transforms into a true wonderland and comes alive during December to March. With frozen icy rivers, Russian-inspired architecture and a renowned annual ice sculpture festival, its residents certainly do not hibernate to escape the chill. If you are looking to visit this magnificent city, choose to relax in luxury and stay at Kempinski Hotel Harbin. Offering panoramic views and world-class facilities, you will be located only minutes from the wonderful architecture and famous Sun Island. Areas of China also experience monsoon seasons. As temperatures rise and rain falls, visitors will experience high humidity levels if they choose to travel to some of the country's most south-easterly locations. Particularly throughout June and July, the cities of Guiyang, Haikou and Guangzhou experience heavy rainfall. Temperatures can reach over 30˚C, while lows barely drop beneath 19˚C. The heavy rainfall creates humidity levels of 80%. Annual monsoons tend to hit during autumn, at least two to three times a year. However, rain is not always a common occurrence. Spring and winter are recommended for visitors, with temperatures still reaching 18˚C throughout November and December. If you are planning a trip to China’s more tropical climates in the south east, unmissable sights include Shamian Island, the colourful Canton Tower, Hainan Crater Park and the many historic locations in Guiyang, such as Qingyan Ancient Town, the awe-inspiring Jiaxiu Tower and the picturesque Qianling Park. Experience the city in slightly calmer weather conditions during the months outside of the monsoon season and stay at Kempinski Hotel Guiyang. Cool winters, brisk spring mornings and warm summer evenings can be found in many regions across China, with the fantastic capital of Beijing being one of the most notable. With fairly mild weather all year round, average temperatures in January often drop to -4˚C while July often enjoys sunny skies and 27˚C. Regardless of the temperature, there are many incredible sights to see regardless of the weather. With its extensive history and a vibrant modern culture, you will not be short of activities while in Beijing. Whether you are making a short 24 hour visit or staying for two weeks, the large collection of various tourist spots and ancient locations will keep all entertained and inspired. From the Great Wall, ancient Forbidden City and the Buddhist Lama Temple to the unique 789 Art District, there is something here for everyone. If you are considering a trip to Beijing, you may wish to stay with Kempinski in the luxurious Kempinski Hotel Beijing Lufthansa Center. 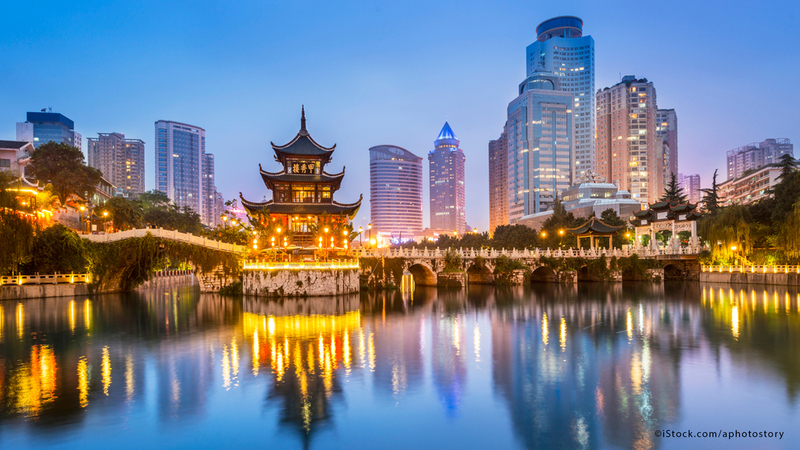 With over 500 elegant rooms, it is a great base to discover the wonders of China's capital. Mountainous escape or cultural break in the sun, whatever you are looking for China is sure to have a destination to suit. Here at Kempinski we have over 15 world-class hotels around China - click here to find your perfect location.